Simulated "Higgs" event in ATLAS. The superconducting toroid coils are in grey, and the muon chambers in green. Muons can penetrate through the calorimeters and reach the outermost part of ATLAS, known as the muon spectrometer. This spectrometer surrounds the calorimeters and measures the trajectories of muons to determine their direction, their electric charge and their momentum. This happens inside a volume of magnetic field produced by superconducting toroïd magnets. The detection elements (the muon chambers) are made of thousands of metal tubes equiped with a central wire and filled with gas. As a muon passes through these tubes, it leaves a trail of electrically charged ions and electrons which drift to the sides and center of the tube. By measuring the time it takes for these charges to drift from the starting point, it is possible to determine the position of the muon as it passes through. 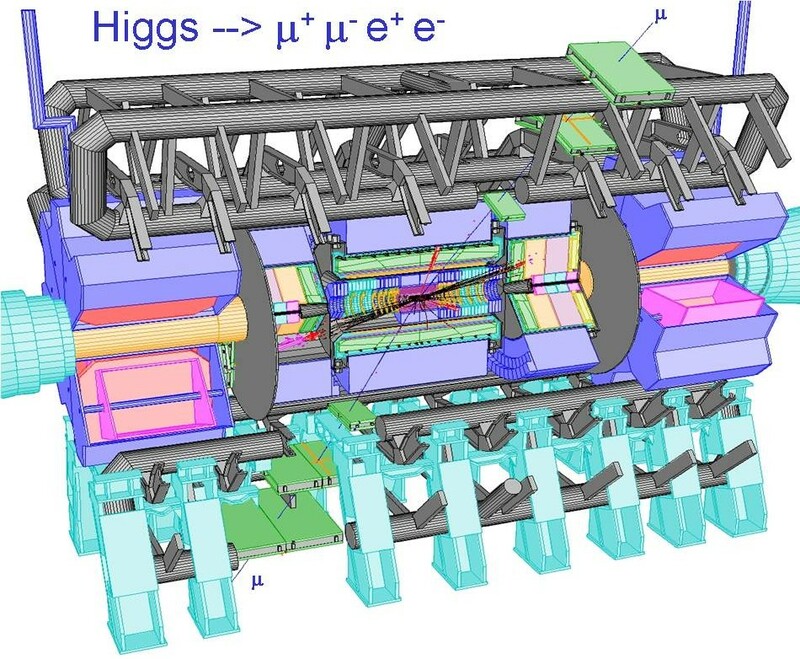 Muons reach the spectrometer with little perturbation from their journey through the calorimeters and are an essential signature of new phenomena, in particular in the search for the Higgs boson or a heavy Z' boson. Three layers of more than 650 muon chambers are installed in the barrel muon spectrometer. In order to achieve the required transverse momentum relative resolution of 10% for a 1 TeV muon, the track curvature (sagitta) must be known with an accuracy of ≈ 60 microns. An optical alignment system is used to infer the positions of the chambers within 30 microns, as well as the chambers' deformation. The muon chambers are thus called MDT chambers (Monitored Drift Tubes), "monitored" referring to the optical alignment devices the chambers contain. The magnetic field configuration and in particular the muon spectrometer is a unique charateristic feature of ATLAS. The magnetic field is provided by four superconducting magnets: a solenoid surrounding the inner tracker and three air core toroids (one barrel and two endcaps), each made of 8 coils. The one of its kind barrel toroid generates a magnetic field in a very large volume. This volume is instrumented with 3 layers of muon chambers covering an area larger than several rugby fields. 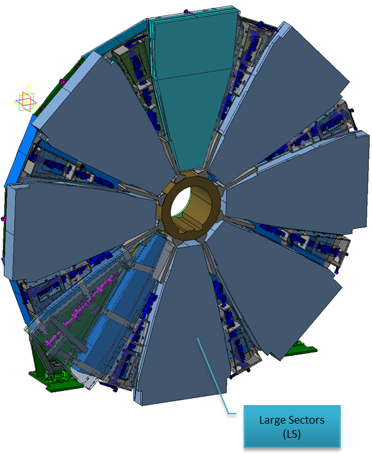 The IRFU group has taken charge of the alignment system of the barrel spectrometer, the field measurements in the toroids, and the muon reconstruction software. Alignment system for the barrel muon spectrometer. - The ressources devoted to this project (Alignment and magnetic field in the barrel spectrometer) amount to an average of ≈100FTE over a period of 14 years, including 5 years of R&D. 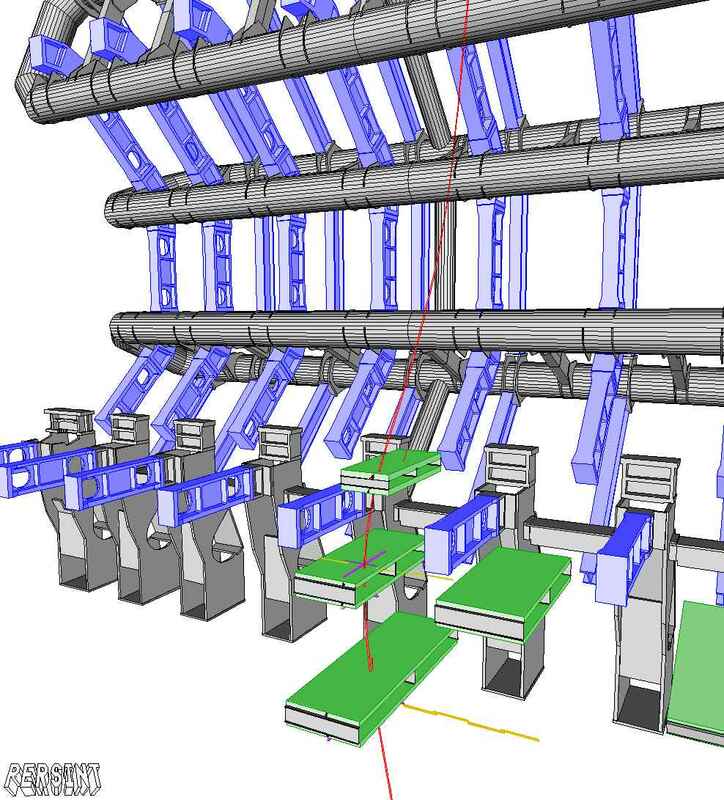 In order to achieve the required precision in the measurement of the muon track curvature (60 microns), the muon chambers are equiped, at strategic locations, with a grid of 5800 triplets of optical devices which continuously monitor the chamber positions and deformations. The required precision of the alignment system is 30 microns over distances larger than 10 meters. An optical line uses a beam of infrared light to align 3 chambers, each being equiped with one element of the triplet. The image of a back lighted chessboard mask, precisely positionned on the first chamber, is projected on a CMOS image sensor located on the third chamber through a lens located on the second chamber. The combination of the 5800 measurements makes it possible to determine the positions of all chambers at all times with the required precision. 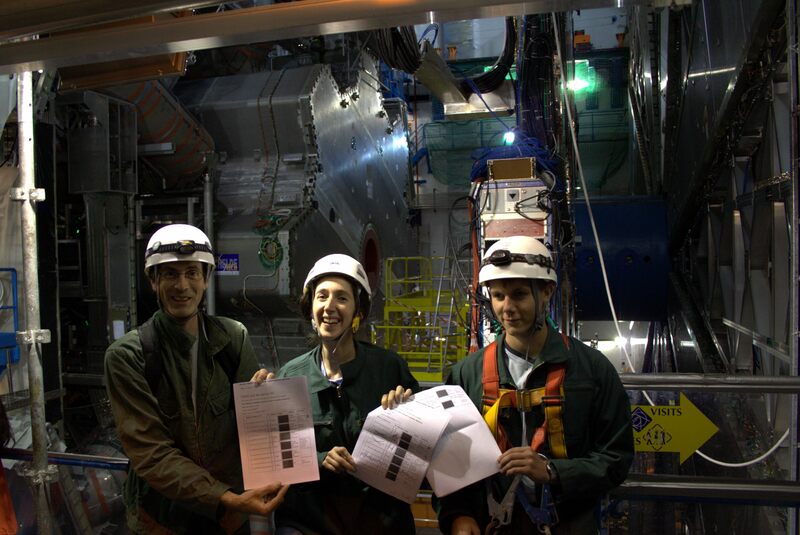 The alignment system was successfully tested during the commissioning of the toroid magnet. The eight coils of the magnet were equiped with infrared cameras to form 128 optical lines with the chamber sensors. As a current of 21 kA was circulated, coil movements of 1-2 mm were recorded, as expected. A precise magnetic field map, rapidly and repeatedly accessible by the reconstruction programs (e.g. "Muonboy"), is needed to measure the momentum of muons. The field is determined using 1800 sensors equiped with 3 Hall probes measuring the three components of the field. Placed close to the coils, these sensors provide the needed measurements to calculate the magnetic field everywhere in the spectrometer with a precision of 1mT. The sensors were inter-calibrated to correct for geometrical and temperature effects. Contributions to the field comming from magnetic material in ATLAS, e.g. 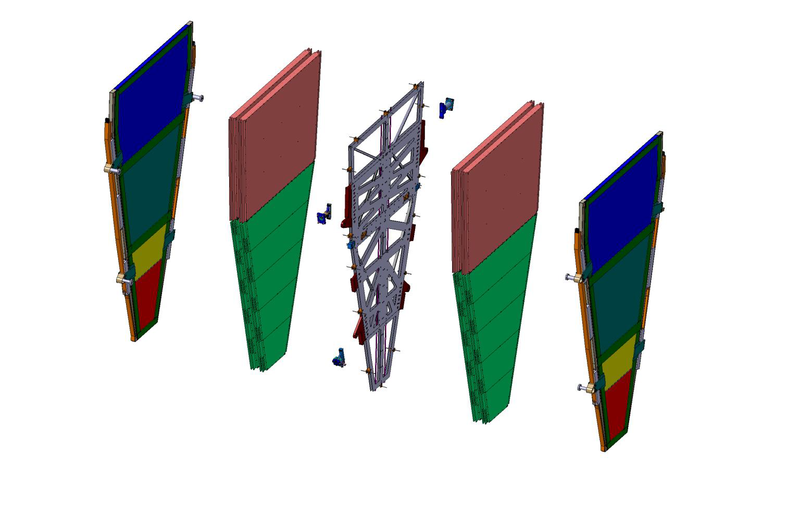 the iron hadron calorimeter and support structures, are taken into account through finite element calculations. ATLAS must face new challenges. This experiment is the largest and most complex detector ever built for a particle physics experiment. The total weight of ATLAS is 7000 tons, its size is 25m in diameter and 46m in length, and it features 100 million channels of electronics. The challenges are in mechanical engineering, industrial manufacturing of state of the art particle detectors and magnets, radiation hard electronics, sophisticated trigger electronics, high speed world wide data transmission, usage of very large data bases, complex software packages for data analysis. Due to very high intensity proton beams, detectors as well as electronics must be designed to sustain considerable radiation. Also, because the LHC produces one billion collisions per second, the amount of data to be sorted, processed and stored reaches levels never achieved before. The analysis of these data is performed in universities and laboratories round the world using the "computing grid". The grid's purpose is to make all the usable worldwide computing and data storage power available in one network of resources. - 2008-2009: Global test of magnet system, final comissioning of alignment and magnetic field measurement systems. Start taking data. - November 2006: For the first time, the full current was injected into the assembled toroid coils in the ATLAS cavern. Measurements of the magnetic field were performed. The alignment system was used to monitor the deformation of the coils during ramping. A complete spectrometer tower of three layers of muon chambers was commissioned as cosmic rays were recorded and analysed with the alignment corrections provided. -2017-2019: Construction of about 25% of the MicroMegas chambers (>250 m2) for the New small Wheel project which aims at replacing the front wheels (first layer of the forward parts of the muon spectrometer). The goal is to improved drastically the trigger capability in the forward region and to be able to cope with the very large muon rates expected at the HL-LHC (starting in 2026). - 2018-2020: Installation of the New Small Wheel based on MicroMegas (MM) and TGC chambers. The alignment system of the barrel part of the ATLAS muon spectrometer. J.C. Barriere et al. ATL-MUON-PUB-2008-007; http://cds.cern.ch/record/1081769/files/muon-pub-2008-007.pdf. The control on the deformation of the ATLAS barrel toroid warm structure. F. Bauer, A. Foussat, P.F. Giraud, C. Guyot, B. Levesy, P. Ponsot, P. Schune, Z. Sun, P. Vedrine (DAPNIA, Saclay & CERN) . 2007. 4pp. Frontier Physics, La Biodola, Elba, Italy, 21-27 May 2006.
reconstruction in the 2004 ATLAS H8 setup. F. Bauer et al. 2007. 4pp. J.C. Barriere et al. 2006. 4pp. Particles and Imaging, Bonn, Germany, 5-8 Sep 2005. J.C. Barriere et al. DAPNIA-04-508, Apr 2005. 5pp. (NSS / MIC), Rome, Italy, 16-22 Oct 2004. Status of the alignment sensor calibrations in the ATLAS muon experiment. Y. Reinert, J.P. Schuller, P. Schune (DAPNIA, Saclay) . DAPNIA-04-507, Apr 2005. Switzerland, 27 Sep - 1 Oct 2004. By Saclay hardware alignment group (P. Schune et al.). DAPNIA-03-79, Apr 2003. An optical sensor for the alignment of the ATLAS muon spectrometer. J.C. Barriere et al. DAPNIA-03-47, Mar 2003. 3pp. 2002), Beaune, France, 17-21 Jun 2002. J.C. Barriere et al. DAPNIA-01-03, IWAA-1999-020, 2001. Frontier Physics, La Biodola, Isola d'Elba, Italy, 21-25 May 2000.
with respect to a reference laser beam. J.C. Barriere, O. Cloue, C. Guyot, P. Ponsot, J.C. Saudemont, J.P. Schuller, P.
Schune, S. Sube (DAPNIA, Saclay) . DAPNIA-99-04, Sep 1999. 10pp. The ATLAS Collaboration. New Small Wheel Technical Design Report; CERN-LHCC-2013-006. CERN, Geneva, 2013.